As the adult webcam industry gets more and more competitive, retaining and attracting quality live webcam entertainers as well as keeping visitors coming back for more has to be a constant challenge. I ran across a survey that as posted in broadcasters windows for performers on Chaturbate, which I thought was interesting that I wanted to pass along. For those that do not know, Chaturbate.com is the fastest growing adult webcam site in the world and the only adult webcam site that offers models app and bots to make their shows run more effectively. Anyway, above is the survey that performer Blaze Fyre posted which gave performers a chance to share their input on ways the site can improve. 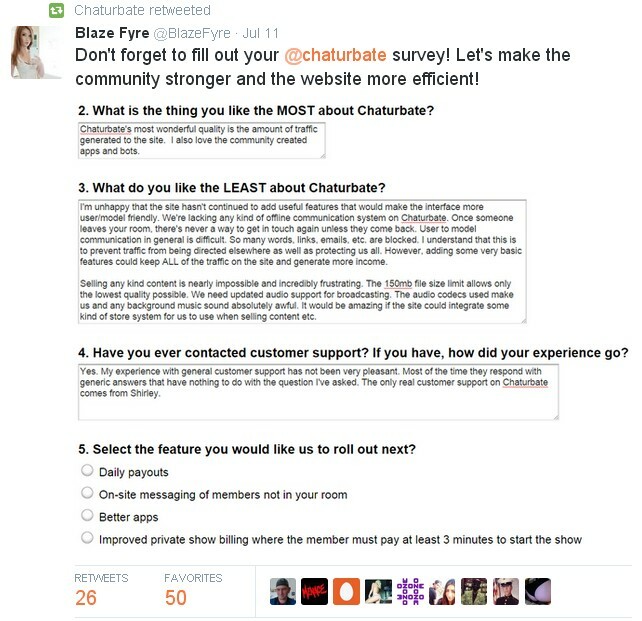 We have no inside knowledge about the results of this Chaturbate survey, but it was interesting to read about the ideas for possible future features and see how a platform engages with models to get their input and feedback. Likewise, I have always wondered if any of the largest adult webcam sites would ever establish a ‘minimum private show’ time frame; such as the last feature idea on question #5 this Chaturbate performer survey. One has to wonder if a 3 minute private show minimum isn’t a reasonable expectation of customers. However, so far none of the adult webcam sites have such minimums; or at least none that we are aware of.